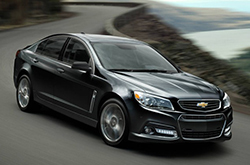 At the crossroad between performance and luxury, between speed and style, lies the new 2015 Chevrolet SS Sedan. A polished and well-rounded means of transport, the new SS captures the true essence of the sport sedan, combining convenience, technology and refined amenities with pure unadulterated power. The new Chevrolet SS is made for Phoenix car enthusiasts, delivering the comfort of a luxury sedan with the feel of a sports car, beauty and the beast on 4 wheels. Continue reading out 2015 Chevrolet SS review below for added information, specifications, features and more! With a newly designed Magnetic Ride dampening system, the 2015 SS features three driver-selectable controls for optimal response and improved handling on any roadway. The 6.2-liter LS3 small-block V-8 is a powerhouse with the optional TREMEC� 6-speed manual transmission, or Hydra-Matic automatic transmission with paddle-shifters, delivering a staggering 415 horsepower and 415 lb.-ft. of torque. Track-capable Brembo front and rear brakes, a MacPherson sport-tuned suspension and variable-assist electric power steering system also contribute to the overall vehicle dynamics. 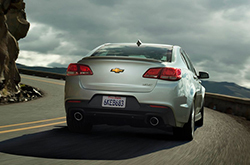 Not to overlook safety, the new 2015 Chevy SS in Phoenix offers some of the most technologically advanced safety features available. Front-facing camera sensors that alert drivers to potential threats immediately ahead, lane departure warning alerts for drifting, blind-spot radar sensors, a cross-traffic warning system, StabiliTrak electronic stability and traction control, and 8 advanced airbag designs round out the comprehensive collection of safety features --all standard on the 2015 Chevrolet SS. Also included standard on the new SS Sedan is the 8-inch color touch-screen display and Chevrolet's MyLink infotainment system with Bluetooth smartphone integration. This pairs well with the OnStar 4G LTE system with a built-in Wi-Fi hotspot (data plan required). Other standard features include a leather-accented console, power-adjust front seats, a rearview backup camera, push-button start, a Bose 220-Watt nine-speaker audio system, and turn-by-turn navigation. By combining timeless style, advanced technology and unbridled performance, the 2015 Chevrolet SS, on sale in Phoenix, is truly the car made for people who love to drive. Whether it is dropping off the kids at school or burning laps at the track, the SS performs admirably. Premium details, strong acceleration, refined performance and undeniable luxury, test drive the new Chevy SS today at Midway Chevrolet in Phoenix and fall in love! When you compare Chevrolet's new 2015 SS next to the 2015 Nissan GT-R, Ford Mustang and the Dodge Challenger, we're sure you'll discover that the SS is the best match for you. Shoppers will benefit from the SS's low sticker price, as well as its tasteful exterior design. You'll clearly see it's a truly outstanding value when you compare its price to competing vehicles. Check out our Quick List below this text for more information! 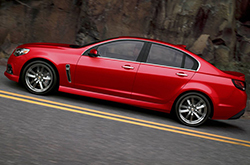 The 2015 Chevrolet SS review above was penned by Midway Chevrolet's professional writers; for information about past models please view the links in the sidebar. Not all car dealerships in Phoenix are the same. We feel it's our mission to serve customers with quality vehicle reviews; this sets us apart from the typical dealership. Jammed with ultra-precise information and specs, each summary gives you complete details about all the SS has to offer Phoenix drivers in terms of fuel economy and much more. Learn all about our entire selection of great automobiles! If the SS isn't the right option for you, we've got many other Chevrolet reviews and car comparisons. Visit our research library to view them now!